The mission of Music Therapy Services, LLC is to provide exceptional music therapy services to assist clients in reaching their fullest potential through music. Music Therapy Services, LLC provides person-centered, integrative, and strength-based approaches to address the needs of the whole person, and strives to promote the field of music therapy through advocacy, research, and education. Music Therapy Services upholds the inherent dignity and worth of every individual. Our Music Therapists use a person-centered and strength-based approach to help clients reach their highest potential using music as our tool. Music therapy ivolves music experiences, both instrumental and vocal, passive and active, designed by the Therapist to facilitate changes which are non-musical or musical in nature. 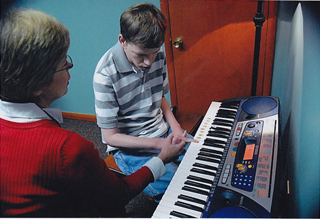 Music Therapy intervention is based on individual assessment, treatment planning, and ongoing program evaluation. The Music Therapist functions as part of the interdisciplinary team to enable each individual to achieve defined goals and objectives. No previous musical experience is necessary to benefit from music therapy!